His career was inspired by seeing Lachie Stewart win in Edinburgh in 1970 and it inspired him to take up running at school. Then he joined Bellahouston Harriers and he remebers that his first race was cross country on a snowy course in tennis shoes! Nevertheless, he loved it and his career as an athlete started from there. George was initially a very good 800 metre and 1500 metre runner and this speed showed at the end of many races – note how close Terry Mitchell was at the end.. George was a class act with a wide range of talent from 800 right up to the marathon and in July this year (2010) he completed the questionnaire as follows. CLUB: Bellahouston Harriers and then Springburn Harriers. HAS ANY INDIVIDUAL OR GROUP HAD A MARKED INFLUENCE ON EITHER YOUR ATTITUDE TO THE SPORT OR ON YOUR PERFORMANCES? I trained and learned from Frank Clement and mostly working with Nat Muir’s training regime. WHAT EXACTLY DID YOU GET OUT OF THE SPORT? The buzz of racing! CAN YOU DESCRIBE YOUR GENERAL ATTITUDE TO THE SPORT? Pretty negative at the moment. The strucrure has always been wrong for promising young talent. There are too many drugs in the sport and it is hard to believe outstanding performances. WHAT WAS YOUR BEST EVER PERFORMANCE? Finishing second to Nat Muir in the Scottish Cross Country Championships. AND YOUR WORST? 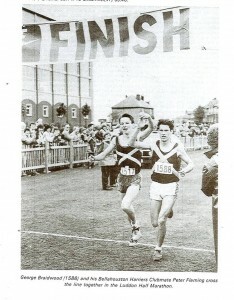 Beating Lasse Viren to second LAST in the World Cross Country Championships at Gateshead. DID YOU ACHIEVE ALL YOUR GOALS OR WAS THERE SOMETHING THAT YOU THINK YOU MISSED OUT ON? I missed out on a sub-4 minute mile, sub-14 minute 5000 and most of all not getting picked for the Edinburgh Commonwealth Games despite winning the Scottish 5000 metre Championship the year before. I suppose picking officials over athletes was more important. WHAT DID RUNNING BRING YOU THAT YOU WOULD NOT HAVE WANTED TO MISS? Countries visited, meeting and beating/losing against other athletes, World Cross Country Championships; Alex Naylor training group at Coatbridge during the Coe and Ovett era; training with some great characters too many to mention including my friend and rival Adrian Callan who suffered a disgraceful omission by the selectors for the Edinburgh Commonwealth Games. COULD YOU GIVE SOME DETAILS OF YOUR TRAINING AND/OR YOUR TRAINING PHILOSOPHY? Winter average was 90+ miles per week including two fast long sessions and Sunday long run. Summer average was 80+ miles per week including three track sessions. Taper down for Championships. I liked to train hard and not let on! So there you have it and I’ll comment on some of the replies over the next couple of paragraphs. Let’s take the big one first and the big one for me is the non-selection for the 1986 Commonwealth Games which was indeed a fiasco as far as many of the runners were concerned. Selection of the team was a disgrace. Adrian Callan (Springburn Harriers) was a sub-four minute miler who had won the SAAA 1500 metres that year. He had been assured by a prominent figure in the establishment that he would be selected if he won the championship no matter what the time. He won and was not selected with the man in question denying that he had said anything at all. Adrian was one of the nicest guys I have ever met in over 50 years in the sport and he was really upset. He asked me (I was Scottish Staff Coach for 5000/1000 at the time) if I would take the Championship Trophy back – I refused, selections were not my responsibility but suggested that he return it to the President of the SAAA who lived near him. This he did. Adrian was the worst example but others such as George were entitled to feel really aggrieved. Many athletes, parents and coaches had their attitudes to the sport soured at that time. Very good athletes were not selected, good athletes were selected for events that were not their best ones and I know of two endurance athletes – one living in Glasgow and one in Edinburgh – who offered to pay for their own kit and live at home rather than in the Village to save money. But even although there were places available in the events in question, their offers were turned down. Back to the questionnaire, this time for cross country. George was no newcomer to the sport when he finished second to Nat Muir in the National Cross Country Championship at the Jack Kane Centre in Edinburgh in 1983. One of the famous very good group of Bellahouston Harriers he had won the Midland District Senior Boys Cross Country Championships away back in 1975 and won many medals on the track and over the country individually and as part of a team. He ran for the Scottish team in the International Cross Country Championships in 1983, 1984 and 1985. In 1982/83 he had already won the West District Senior Championships before Nat Muir defeated him by a mere six seconds in the Nationals with Fraser Clyne of Aberdeen another 12 seconds adrift. In 1984/85 he anchored the Bellahouston team to second in the West District relays finishing only one second in front of Kilbarchan. He started 1985 well by winning the Nigel Barge Road Race in Maryhill by one second from Graham Laing of Aberdeen. George was a handy man if there was a sprint finish whether on road, track or country! In the International at Cumbernauld he was second but led the Scottish team to victory. The Bellahouston team of which he was a member won the McAndrew, Scally and National Six Stage Relays. 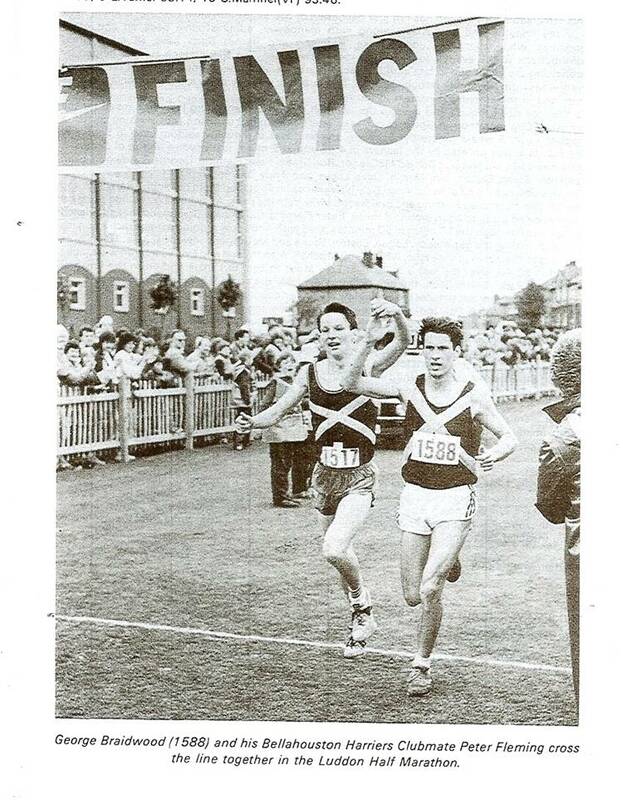 He went on running and racing well and in 1988 won silver in the Six Stage with a sparkling run – but for Springburn Harriers with Bellahouston in third place. He had changed clubs about three months earlier and living in Bishopbriggs, it made sense to move to the local club. On the track, his list of road and track pb’s is more modest than it need be! My own opinion is that 1985 was probably his best year for track running with 3:48.71 for 1500 metres, 7:58.83 for 3000 metres and 14:01.17 to be second fastest Scot for the distance. The 5000 metres time was set winning the SAAA 5000 metres title. I know that he was a very good 800 metre runner because he ran in several invitation races over the distance that I put on and was certainly worth better than his personal best of 1:52. Having reported on his second Luddon win above, it seems appropriate to do the same for his first run in the event. The report in the SMC Magazine by Alistair McFarlane is below. “Despite the late call-offs by Graham Laing (saving himself for the European Cup Marathon in Spain two weeks later) and Colin Youngson (not wishing to risk a niggling injury 3 weeks before the Scottish), the field was of a quality seldom seen in Scotland. The first mile was covered by the leaders in 4:55 and at 5 miles, just before Milton of Campsie, there was still a big group of Donald McGregor, Rod Stone, Peter Fleming, George Braidwood, Evan Cameron, Stuart Easton, Jim Martin, Dave Logue and Andy Daly in 25:50. This was obviously a bit slow for Andy Daly however as he stretched them out soon afterwards and took his two clubmates Fleming and Braidwood away from the pack. Andy however couldn’t sustain it and allowed a gap to open around 8 miles. Peter Fleming and George Braidwood looked relaxed as they went through the ten miles in 50 minutes dead with Andy now running a brave race all on his own and keeping the gap steady. Logue, Easton, Stone and McGregor showed 50:30 at 10 miles as they staged their own private race while Terry Mitchell, Alan Wilson and Evan Cameron were close behind in 50:40. Over the last three miles past Low Moss Prison to Lenzie and on to the finish at Woodhead Park, Kirkintilloch, the two leaders obviously did some talking and decided to finish together in the very fast time for the accurately measured course of 65:23, although the judges split them on the line. Andy Daly took advantage of some slackening of the pace up front to close a little and got the gap down to 8 seconds at the finish. Dave Logue shrugged off his challengers and looked strong as ever in fourth place while Stuart Easton had his best run for many a day to get the better of Rod Stone and Donald McGregor who of course lifted the first veteran’s prize of £40. Janet McColl for once had some opposition in a road race although she made light of it to beat Liz Steele by 3 minutes. He ran many road races and ran well in them all. Like all Scottish club runners of the time he did of course turn out in the Edinburgh to Glasgow for both the clubs he ran for. He was unfortunate that in his first run in the event in 1977 he was asked to race the second stage which is very demanding for a first year Junior: he dropped from first to twelfth in a time of 31:46. Most of his races were on this stage and his best run was probably 1982 when he was second fastest on the stage with 29:12. The following year though he was third fastest on the fifth stage running in second position to see the young Bellahouston team finish second and pick up the silver medals. In 1984 he was back on the second stage and running the second fastest time to move the club from fifteenth up an amazing ten places to fifth and in 1985 he was first on the first stage of the race. After joining Springburn he ran in two E-G Relays (in 1991 and 1992)where he ran well: in ’91 he moved the team from 19th to 14th on the second stage and in ’92 he was sixth on the first leg. George was always a good road runner – one of the best and he could have been an outstanding marathon man had he come to the event earlier. He only ever ran the one marathon and that was late in his running career. He recorded 2:21:27 in his first and only attempt at the distance in Glasgow where he finished tenth in a good field. He reckons he would have liked to run in London but after 1987 the pressures of business got in the way. 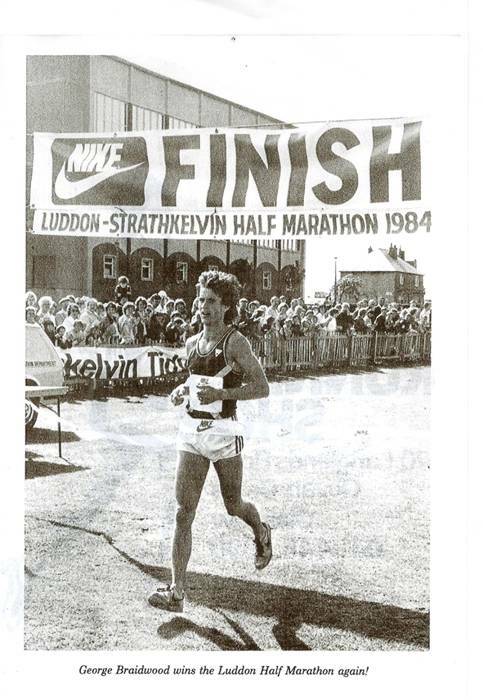 We have looked at his performances on the country and they were excellent, we have looked at his performances on the track where he set first rate times and won a Senior Men’s Scottish championship in an era that was very good for endurance running in Scotland, we have looked at his running in the Edinburgh to Glasgow and in the two Luddon Half Marathons. His range of talent was so wide that he could have excelled as a pure track runner had he concentrated on that, he could have really excelled as a marathon runner had he turned in that direction early in his career. Where many are pushed in one direction or the other by restrictions on their ability, it was maybe the case that George had too many options open to him! I have mentioned already the Bellahouston Harriers group of which he was a member and with whom he had grown up. The table below indicates the range of and depth of talent in the squad. I should note that the 10000m is track running and I would dearly love more information about Graeme Getty’s performances other than marathon. His thoughts on why the Bellahouston group was so good with so many men under 2:30 for the marathon are simply that it was a good era to be running distance races and that there was a healthy competition in the club. He always liked to race on Saturdays and so Sundays became a long recovery run of 17 – 18 miles in good company.